The Marine Unit is administered under the District 2 Patrol Division, and staffed by members of the Operations Bureau on a rotating basis. The Daytona Beach Police Marine Unit patrols the waterways and marinas within the city limits of Daytona Beach. 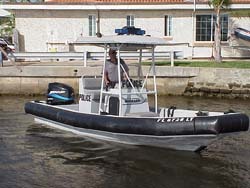 The marine unit officers enforce Federal and State laws, as well as City Ordinances. The members of the unit frequently conduct vessel security inspections to promote boating safety throughout the waterways. In addition, they arrange for the removal of abandoned and derelict vessels left anchored or adrift in the river.